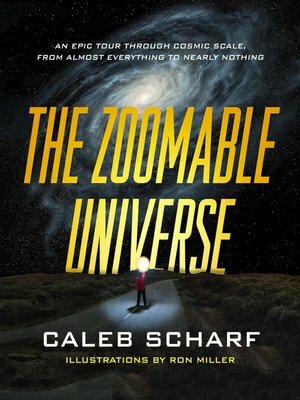 In The Zoomable Universe, the award-winning astrobiologist Caleb Scharf and the acclaimed artist Ron Miller take us on an epic tour through all known scales of reality, from the largest possible magnitude to the smallest. Drawing on cutting-edge science, they begin at the limits of the observable universe, a scale spanning 10^27 meters—about 93 billion light-years. And they end in the subatomic realm, at 10^-35 meters, where the fabric of space-time itself confounds all known rules of physics. In between are galaxies, stars and planets, oceans and continents, plants and animals, microorganisms, atoms, and much, much more. Stops along the way—all enlivened by Scharf's sparkling prose and his original insights into the nature of our universe—include the brilliant core of the Milky Way, the surface of a rogue planet, the back of an elephant, and a sea of jostling quarks. The Zoomable Universe is packed with more than 100 original illustrations and infographics that will captivate readers of every age. It is a whimsical celebration of discovery, a testament to our astounding ability to see beyond our own vantage point and chart a course from the farthest reaches of the cosmos to its subatomic depths—in short, a must-have for the shelves of all explorers.